The Goodguys 19th Meguiar’s Del Mar Nationals is a colorful “Full Throttle Fun” hot rod & custom car automotive themed festival featuring over 2,500 hot rods, customs, classics, street rods, muscle cars & trick trucks through 1987 vintage. In addition to the acres of gleaming vintage vehicles, this event showcases vendor exhibits, indoor car show, a swap meet and cars-for-sale area, special “themed” parking areas on Saturday, Nitro Thunderfest, Goodguys Autocross (to test vehicle agility and performance), model car show, kids fun – PPG Coloring contest, Revell model car kit make ‘take sessions, and lots of fun for the entire family! In 1960 the famed “Mercury Seven” trained at NASA to become the first American astronauts. But they weren’t alone. Thirteen women also underwent the same rigorous psychological and physical testing. The first woman to be tested, Jerrie Cobb, even out-performed her male counterparts. But while Alan Shepard and John Glenn went on to become household names, Ms. Cobb never got that chance. In vividly theatrical terms, the west coast premiere of They Promised Her the Moon tells the unknown true story of this exceptional and unjustly overlooked woman—skilled aviator, world-record-holding pilot, successful business executive—and the powerful forces that kept her from reaching orbit. Come celebrate spring by taking a Yaycation at the San Diego Zoo! As the days grow longer, the Zoo bursts into bloom with fun for the whole family. Join us for oodles of special animal experiences, a fun treasure hunt, tasty limited-time treats, and laughter with Zany Dr. Zoolittle, as the San Diego Zoo Rock Radio DJ adds to the lively beat. 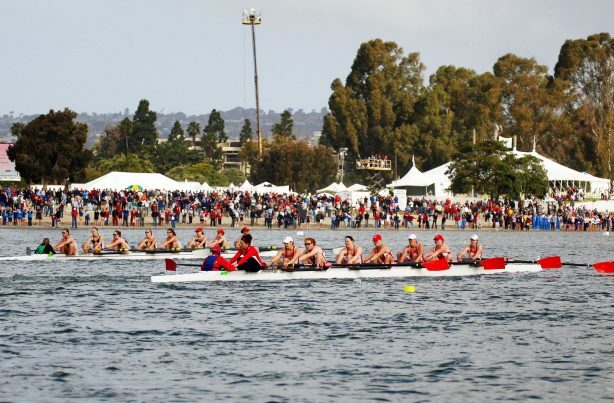 Regarded as the first major regatta of the year, the San Diego Crew Classic brings together thousands of athletes from more than 100 universities, clubs and high school programs across the United States. Spanning ages 14 – 84, the Crew Classic is a competition for future Olympians as well as for those new to the sport. This event is often a highlight of their competitive rowing careers. The Crew Classic is not only an athletic event with competitors at the peak of physical fitness, but a social gathering for enthusiasts to enjoy great local food, a beer garden with San Diego’s famous local craft breweries, and shopping. Julian Gold Rush Days celebrates the discovery of gold in this mountain community and invites visitors to learn more about its history with a weekend of entertainment including gold panning, tomahawk throwing, candle dipping and more. Located at The Julian Farm and Orchard in Wynola, the old fashioned mining camp will offer re-enactors, an arts and crafts market, food and drink, old fashioned laundry, free parking and plenty of family fun. The 12th annual North Park Festival of Beers is back on Saturday, April 6, sampling more than 50 beers from the best breweries on the planet! Presented by 91X and San Diego CityBeat. Enjoy over 200 wines and champagnes from across the globe, gourmet food trucks, live dj, lawn games and more! Bring your picnic blankets or beach chairs and come hang out to sip and savor on the water. The San Diego Legion is partnering with the Blood Bank to present our first annual Give Blood, Get Rugby game. We will face off agaisnt Austin Elite on Sunday April 7th at 7:30 PM. We are also parterning with Lululemon to bring you Yoga on the Pitch! Gates will open early for a fan wide yoga class brought to you by the ambassadors of Lululemon. Foodies and craft beer aficionados will love SeaWorld’s Seven Seas Food Festival, featuring craft beer from favorite local breweries, plus fresh international cuisine infused with local, sustainable ingredients and unique signature flavors from around the world. Walk through the Butterfly Jungle, a greenhouse filled with butterflies of all colors and sizes. There’s a special thrill in being surrounded by these fluttering beauties—and guests wearing bright colors may find the winged wonders perching on them!